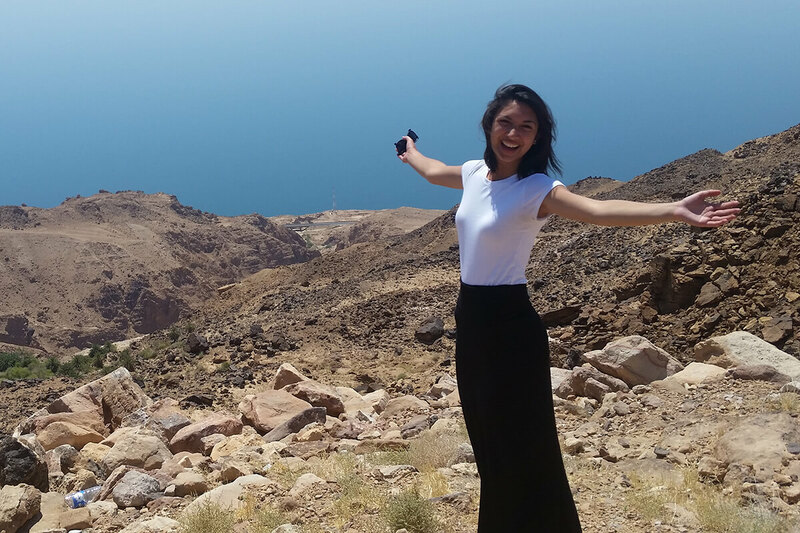 Program of Liberal Studies major Sarah Tomas Morgan stands near the Red Sea in Jordan in 2015. Notre Dame senior Sarah Tomas Morgan has always had an interest in global issues. And the College of Arts and Letters has enabled her to explore that passion through her coursework and a variety of international and internship experiences. Coming into her first year, Tomas Morgan intended on majoring in political science. But after completing a University Seminar in the Program of Liberal Studies (PLS), her plans changed. An interest in international politics led Tomas Morgan to add a minor in peace studies. These disciplines, along with courses in Arabic, have opened several doors for Tomas Morgan to deepen her learning and to gain valuable international experience in the Middle East and North Africa. After her first year, with two Arabic classes under her belt, Tomas Morgan traveled to Amman, Jordan, for an immersive language-learning experience in the Summer Language Abroad program. 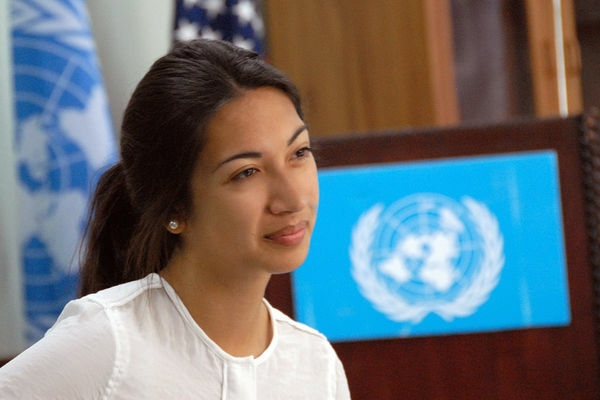 Morgan working at a United Nations Relief and Works Agency refugee camp in Jerusalem. Eager to return to the Middle East, Tomas Morgan secured an internship with the United Nations Relief and Works Agency in East Jerusalem the following summer, through the Center for Social Concerns’ International Summer Service Learning Program. UNRWA is an agency designed specifically to work with Palestinian refugees not covered by the United Nations High Commissioner for Refugees. 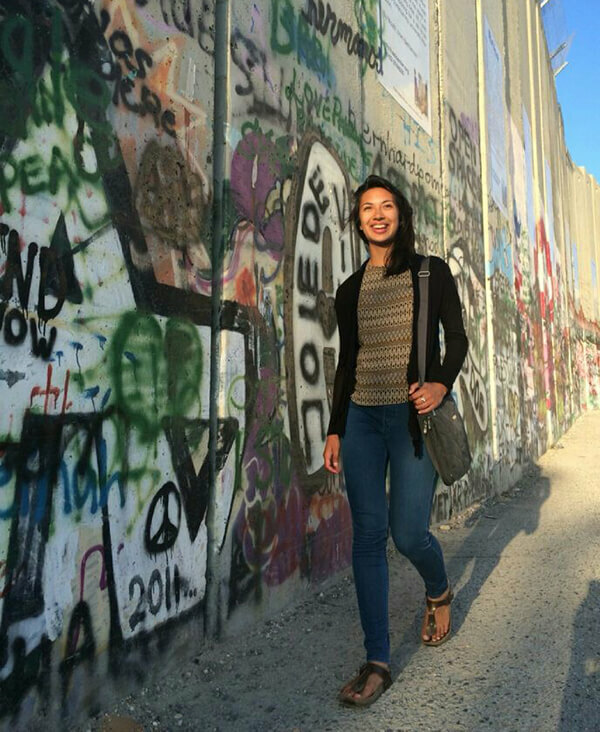 Tomas Morgan’s experience in East Jerusalem helped her see the real-world implications of issues and problems she had been studying in the classroom, while also helping her hone practical skills. In addition to attending various UN events, Tomas Morgan edited documents that had been translated from Arabic to English and got to conduct interviews and reporting for feature stories on Palestinian refugees. “I loved it there, because it not only related to my interest in peace studies and in the region, but it also used my reading and writing skills from my PLS classes,” Tomas Morgan said. Morgan walks past the Barrier Wall in Bethlehem in 2016. The project emphasizes a whole-society approach to countering violent extremism, and Tomas Morgan worked specifically on engaging civil society actors in the project. The experience was her first encounter with a long-term research project, which she values as she develops her senior thesis on the philosophical grounding of human development projects. Ultimately, Tomas Morgan’s time in D.C. helped shape her vision of her future. “It made me realize that I really enjoy research, and I could see myself doing more of it in the future,” Tomas Morgan said. “I like the work of NGOs and the outside-of-government influence that we were able to have. Looking ahead, Tomas Morgan hopes to continue her work on policy relating to refugees and immigrants from the Middle East and North Africa. Before applying for graduate school, she hopes to gain more experience in the field by applying to the Peace Corps or other domestic service programs, or by taking advantage of the connections she made in Washington. Originally published by Teagan Dillon at al.nd.edu on November 28, 2017.